JACKSON, Miss. 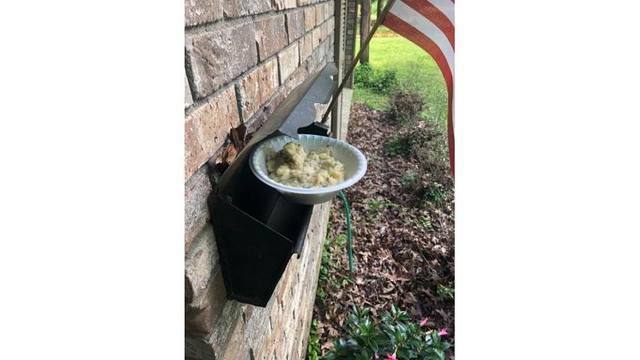 (WJTV) - Mystery mashed potatoes are popping up on front porches in the Belhaven community. Neighbors say they woke up to find mashed potatoes in the oddest of places. While some people think it's just a prank, others are scared the potatoes might be poisoned. Who leaves mashed potatoes on someone's front porch? No, it's not the beginning of a corny joke, it's the question Belhaven neighbors are asking after finding themselves the recipient of this bizarre side dish. "This neighborhood does a lot of quirky things, we decorate road signs we put Christmas trees in our potholes, so it's not surprising at all, that's why I love this neighborhood, because they do so many strange things, but it's definitely one of the weirdest things I've seen since living in Jackson," Jordan Lewis said she found mashed potatoes left on her car. "I got up and was headed to work, 7 o'clock, and there was just a styrofoam bowl of mashed potatoes on the door steps right there," Sebastian Bjernegard pointed to where he found mashed potatoes on his door step. Stepping out and narrowly missing the bowl, Bjernegard didn't think twice about it. "Some people were thinking maybe the mashed potatoes were poisoned to kill animals. I didn't taste it, I have a 3-second rule, so I didn't touch it but some people were worried," Bjernegard said. Others see it as a prank and wonder what the person behind the potatoes will come up with next. The neighbors say there was no need to involve law enforcement on a harmless prank.